Office Storage Tips for the New Year! The first, “Six Office Design Trends to Watch in 2016” by Kontor takes a look at some of the “must-haves” for innovative offices in the coming year. Among the trends, they discuss using rustic wood finishes, bright colors and office interiors that borrow elements from residential design. They also suggest “Furniture on the Go” and “Personal Space” as trends to watch, noting that today’s office inhabitants have varying work styles that require flexibility in office furnishings. Noise levels and employee privacy become concerns in some open plan office layouts, so updated cubicle design, as well as some multi-functional storage options, offer ways to provide personal space. The next article, “8 Top Office Design Trends for 2016” from Fast Company explores some of the same themes of color and texture usage and implementing the rustic look of the outdoors throughout the interior. They also discuss trends like hiding wires and designated lounge areas. Again flexibility is a primary emphasis as 3 of their trends (Multipurpose Workspaces, Community Tables and The End of Permanent Layouts) all address the concerns that office designs and layouts are in the midst of a culture shift. I would encourage you to take a look at both articles if for no other reason than to see the beautiful offices they showcase. Now you may not have a chance to work in an office quite like one of these, but there is a common theme that ties all of these beautiful spaces together – the absence of clutter. That’s where an innovative and well thought out office storage plan comes into play. You would imagine they would have to keep up with office supplies, files, incoming and outgoing mail as well as other things needed to run a business. But this material is out of site (for looks) but most likely readily available (for productivity). Makes you wonder how they did it! Do I need to save space? If space is an issue in your office (and if you are paying by the square foot then it probably is) than one of the best ways to consolidate your storage is by using high density shelving. This sliding shelving on a track system allows you to save as much as 50% of your floor space on what you are storing now, or double the amount of storage in an existing area. The shelving can accommodate anything from file folders and boxes to laptop computers and office supplies. For smaller areas consider replacing 4-drawer file cabinets with open shelving that not only costs less but it makes folder indexing easier to see (and access) and can increase records storage space three-fold. According to data from OSHA, the rate of worker injuries and illnesses are down significantly from 1972, but ergonomics is still a primary emphasis in most businesses. As discussed in this blog post (Take the Vertical Carousel Storage System Out For a Spin!) vertical carousels are an excellent ergonomic storage alternative in both front office areas as well as warehouse and manufacturing areas. Along with bringing the requested items to the user, the vertical carousel units also provide enhanced security and a boost in productivity. How do we stay organized? Establishing general storage and retrieval procedures is a significant first step towards gaining office organization, but make sure you provide the right tools to turn your plan into action. Mailroom sorting systems and mailroom cartsprovide the best way to control the influx of mail and packages that arrive and leave the office. Making certain that control of this flow of material at the source leads to organization benefits throughout the office. Will employees need a secure way to store personal items? Hoteling employees and shared workspaces have been a trend for a few years, and these workers will need a safe place to store their things. C-Thru Storage Lockers will do the trick for looks and security. The lockers come in single, double and triple tier units as well as a box locker style and the acrylic door panels allow you to see the contents inside. On the office design front, there is plenty to look forward to in 2016. 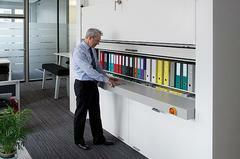 If you are trying to save space and improve the organization of your organization, reach out to us. Your office may not look like some of the ones featured in the stories above, but we can help you with a primary component that they all share – to be free of the clutter. One more thing, if you made a New Year’s resolution to personally up your office game check out “10 Office Organization Tips” on the Superheroyou blog.